Imagine taking a bone stock Jeep and installing a 4.5 inch lift with taller springs; replacement controls arms, longer shackles and a transfer case drop. Add a custom fabricated bumper and winch mount, front and rear lockers and trimmed fenders for clearance. Now imagine doing all that in one weekend. That is exactly the transformation that Matt Gibson made to his Jeep in a friend’s backyard garage in Kentucky. Matt is no stranger to organizing big events as he is the organizing force behind the Kentucky Derby Festival and Thunder Over Louisville. People who only know him from his day job often have no idea how he spends his adventure time. Matt began by securing an appropriate work space. His friend Neal Hoover offered up a nice two bay workshop equipped with compressed air, a welder and plenty of space to work. Next, he made the call to his friends on the Yahoo Groups XJlist for some wrenching help. This diverse group has had many off road adventures together and experience working together from many a trail repairs, but they had never done a project like this one. About a dozen members traveled from up to eight hours away to join the fun and help Matt get his rig built. The main reason that it was possible to build a Jeep so quickly was that Matt already had all the parts he needed except for the front bumper and Winch mount installed on his old faithful XJ Red. Red however was now suffering from severe rust damage and a weakening engine. Rather than continue to patch Red, Matt elected to take over his wife’s white XJ which had just been replaced by a larger SUV. The transformation began on Friday with the group helping Neal clear his own projects from the shop to make space for the two Jeeps. His custom J truck was moved to a safe place at a neighbor’s house for the weekend and his off road XJ took up watch in the muddy yard after being used to load the J truck on the trailer. 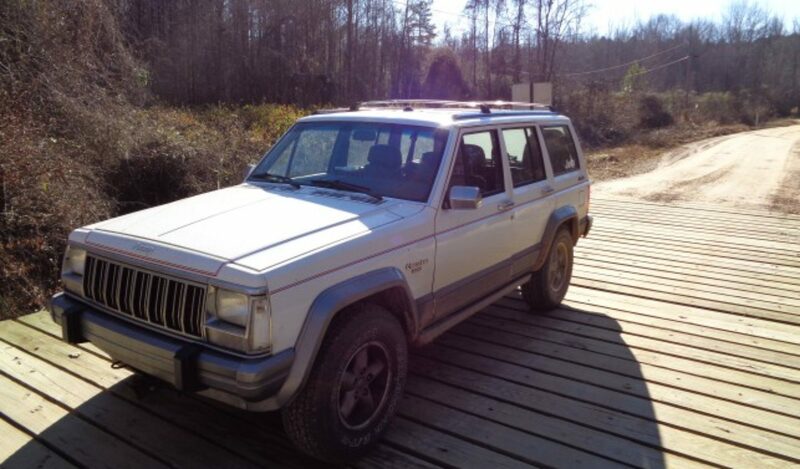 Once the two XJ’s were on jack stands, Evan Purser who traveled form North Carolina began work on removing the front axle as a unit. This would swap the locker, Currie steering, lift springs and control arms with just six bolts or so. So began the good plan violently executed as the control arm bolts were all very rusted. However, as another team set to pulling the front from the white Jeep Evan and his team powered out the rusty bolts and had the axle on the ground and ready for transplant before the mid evening pizza break. Mike Strawbridge and his son Scott who drove from Tennessee began work removing the rear axle assembly. The front spring bolt was rusted solid and even cutting into the floor to access the nut did not release it. They finally had to cut the bolt to extract the spring. On Saturday morning Adam Olukalns, also from Tennessee, began work on fabricating a new bumper and winch mount. After a few mock ups he and Brian Klotz took over the picnic table as a cutting and welding surface and began their art work. Matt’s brother Mitch brought doughnuts and coffee for the group before he, Neal and Wayne set into wrenching on the rear axle of the white Jeep. Matt kept the group organized with complete list of tasks to be done on a white board in the shop. He tried getting involved with the wrenching as much as possible but he was always called away for a decision on the Jeep or for other organizational duties. The rear leaf spring bolts on the white Jeep proved just as stubborn as the red Jeep and the floor had to be cut as the nut broke loose in the unibody. Soon however, both rear axle assemblies were on the floor ready to be swapped. At lunch break Neal took every one next door to see his project custom J Truck. The body was fresh back from the paint shop looked great as the group pushed it out into the sun shine for viewing. Matt’s wife Allison supplied plenty of chili and hot wings for the group to eat and kept the food coming the entire weekend. One the lifted axles were in place under the white Jeep, Mike and Scott set the red jeep on the stock axle even without the benefit of bolts to hold it in place. They put some spare wheels on it and pushed it out side. This made space to move the bumper fabrication process inside. Once inside, Adam began giving welding lessons as he practiced his art. Frosty, a local, welded up the rear floor that had been cut and Mike installed the transfer case drop removed from the Red Jeep. Having so many people working in close proximity proved the team work of this diverse group who mostly see each other once or twice a year. The only resource that became a scarcity was the 220V outlet that had to be shared between welder and the air compressor. The group quickly worked out how to let the compressor run to fill the storage tank and then swap back to the welder. By late Saturday night, most of the list was checked off on the white board. Even his snorkel made the move and was hooked up to the intake. Sunday morning, Mike and Scott loaded up the left over Red Jeep parts to be used on other XJlist member Jeeps. In the shop, final details were made to the bumper and trimmed fenders. The steering was reconnected, seat covers installed and brakes were bled and by early afternoon, Matt was able to drive the Jeep out of the garage. Before the test drive Neal showed the group how to align the front suspension and the Jeep drove perfectly. Being able to build an off road ready Jeep in one weekend was made possible by careful planning and having a great group of friends working together to make it happen. Many of the group commented that this weekend working together was one of the most fun times they have had as a group. That says a lot considering the adventures this crew has undertaken over the years. Working as a team to accomplish a goal and seeing the result drive away was very rewarding. Rewarding not only to Matt, but to all those who worked to make it happen. We all look forward to seeing the new white Jeep on the trail soon.